Yinuo Nosu is a distinct language within the larger Nosu group in southern China. The Nosu are officially considered part of the Yi nationality. There are numerous subgroups and clans among the Nosu. One study reports "24 nationalities of Black Nosu Yi in the Liang Shan." 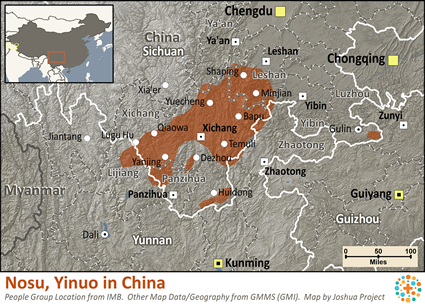 The Yinuo Nosu should not be confused with the Jino ethnic group of southern Yunnan Province whose name is also sometimes spelled Yinuo. The Yinuo Nosu took slaves and fought against the Chinese authorities and other Nosu groups for centuries, until they were disarmed and the slave system was abolished by the Communists when the PLA arrived in 1956. Still today, the Yinuo Nosu remain an aggressive and fierce people. People still today are very much aware of which caste they are from, and marriages between the castes, still in 21st century, are rather an exception although there are a few among the more educated people. Because of the distinctive style of dress formerly worn by the Yinuo Nosu, the region they inhabit is generally known as the "broad-legged trousers region." In the past, the striking characteristic of men's garments was the broad bottoms of the trouser legs. The men no longer where these in daily life. Sometimes there are culture festivals where traditional costumes are worn. The women's traditional dress, however, is still very much in use and can be seen on the streets every day. Women also like to wear wide pleated skirts. The number of pleats sometimes comes to more than one hundred. 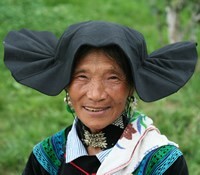 Girls wear multicolored headscarfs made of black cloth. Married women increase the layers of their headscarfs. After having a baby, they wear leaf-shaped bonnets. The various branches of the Nosu have a detailed legend of a great flood. They say there were once three brothers. "Because the eldest was undisciplined, God sent a messenger to the sons to warn them of the flood. The oldest wanted to kill the messenger. The second son bound the messenger and asked him questions. The third politely asked him why the flood was coming. The youngest son, named Dum, built a boat out of wood in 20 days. Twenty days later the rains came. It rained seven days and nights and flooded the whole earth. The two older sons died. The boat landed in the snowy mountains of Tibet. Dum had three sons who populated the whole earth." Despite this and other similarities with Biblical stories, few Yinuo Nosu have ever heard the gospel. Intimidating mountains, rugged terrain, and cultural and linguistic barriers have prevented the gospel from spreading to the Yinuo Nosu. Today there are only a few hundred known Catholics among them. View Nosu, Yinuo in all countries. 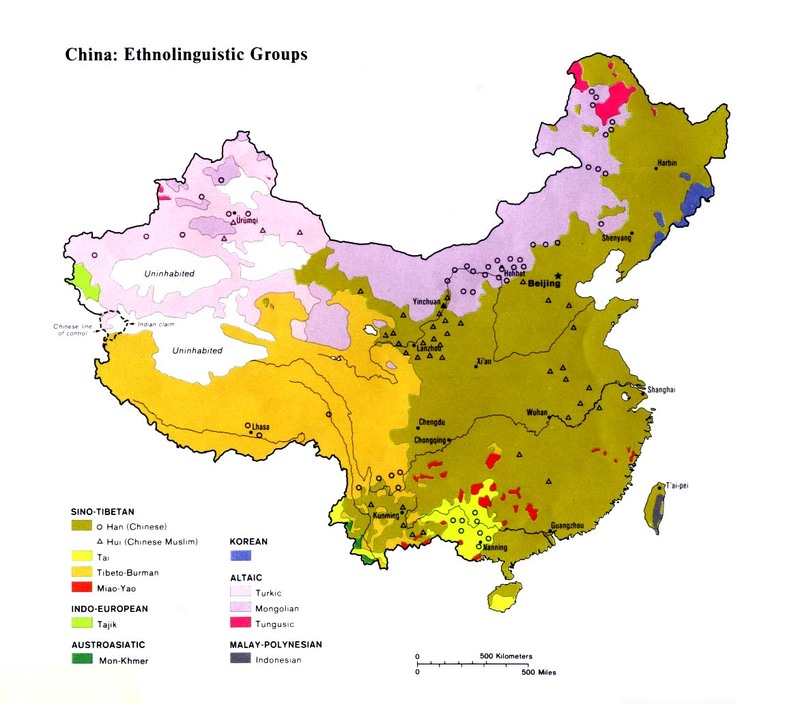 Location in Country: Chinese scholar Shi Songshan listed a 1989 population of 400,000 Yinuo Nosu people, living in remote northern areas of the Daliangshan (Big Cold Mountains) in southern Sichuan Province. The main concentration of Yinuo Nosu live in Meigu, Mabian, Leibo, and Ebian counties, and in parts of Ganluo County. Smaller numbers of Yinuo Nosu live in Yuexi, Zhaojue, and Jinyang counties of Sichuan; and in Yongshan and Qiaojia counties of northeast Yunnan.